On Sunday, we went to church, and then we decided that it was such a beautiful day, that we would take a road trip up to Duluth. The drive is so pretty, and sometimes it is just great to go for a drive. We had lunch in town, then took off. It is a good couple hours to Duluth (more like 3) so, it was good timing with Caleb and Madelyn's naps. We went down to Canal Park, and watched the big ships come in and go under the lift bridge. 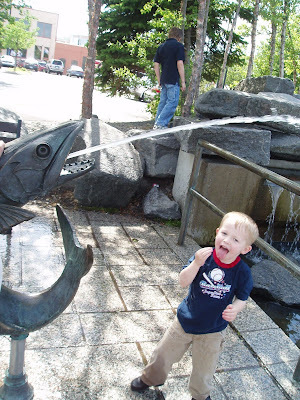 The last time we were in Duluth with the kids was last summer. Maddie was just about 5 months old. Caleb remembered the big boats. He wasn't so impressed with standing under the bridge when it was coming down over our heads. It really is a rush to have the bridge stop just about 5 feet over your head. Madelyn loved waving to all the people on the boats. She kept doing the sign for boats, and she was waving with smiles yelling, "HI!" 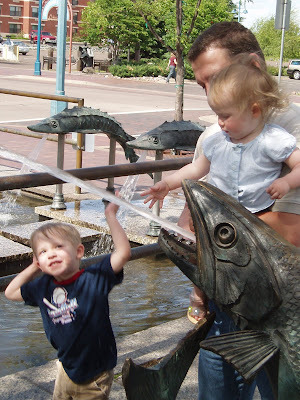 Caleb and Madelyn loved playing with the fountain spouts, too! 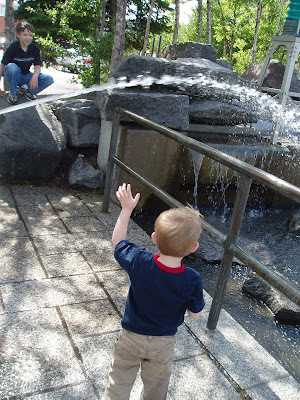 On the way back to the van, Nathaniel and Caleb decided it was hot enough to dunk their head in the fountains. Boys will be boys, I guess. They had fun! After our busy day, we went over to Perkins for supper. We had a great view of Lake Superior. It was great to look out and see those views. Madelyn was so hungry! She ate more than anyone, I think. We drove over to Proctor to see the Duluth Missabe train display before heading out of town. I wish I had been camera ready, because Madelyn was loving the flowers. I handed her a daisy, and she smelled it, and smiled. She just loved carrying around the flowers. We got back late Sunday night, but it was a great family day out away from home. Ease of locks and safe, too! When I get home, I am usually carrying an armload, plus holding on to Maddie. The last thing I want to do is to search for my keys, and fumble with them to unlock the door. I am so thankful that Schlage Locks have created a product to make my life easier! I really like the electronic security with the keypad locks! We don't have to hide a key, carry our house keys, lose or forget our keys with our electronic security. Each family member can have their own code to get into the home! It is so nice, and conveinient! With Schlage Locks we can have up to 19 codes stored in the keypad. What is really nice about this feature is, if we have someone staying at our home while we are on vacation, we don't have to give them a spare key. All we have to do is give them a code, and we can delete it when they are done. Talk about security! This is also great if we are gone during the day, and we have a repair person coming out to fix something. We just give them the code to get in, and delete the code when we get home. I also like the feature of the light up keys on the keypad. This is so nice at night when it is dark. I just click the top key (Schlage button) and all the numbers light up. Installation was easy, too! It only took one tool. We just replaced our deadbolt with a screwdriver in less than 30 minutes. I like that this lock fits round or square corners, or drive-in installations. Schlage offers many different selections of products to meet your needs. I like that they offer different finishes for their locks, so I can pick which one I like best. I am just so grateful for Schlage Locks! Thank you MomCentral for this review opportunity! Kristen Gallagher, from Along for the Ride, is having an amazing contest! For all you babywearing people...and those who want to be a babywearer....you HAVE to check this out! I posted a few pictures for example! They are beautiful! I love wearing my babies, and I would be just tickled pink to win this outstanding contest! Thanks for the generous giveaway, Kristen! I was giving Madelyn and Caleb a duo bath tonight after we came indoors. All was well, until Madelyn started to splash me. She did this the last time I gave them a bath (usually Terry is the bath giver). Last time she stopped when I told her to stop. Not tonight, I told her to stop, and you know what she did? She got this little twinkle in her eye, smiled with her one dimple showing, and did it again even bigger. So, I thought I would get even. (I know, that is the best example to give our kids). I splashed her back, in the face. This was obviously a failing attempt to get her to stop, because she just giggled, and as she was smiling she did it again. This game lasted the entire bath time. My little darling is just a little trouble maker, and loves every minute of it. Isn't that third child syndrome traits? Who is Lanny Sherwin? A review and Giveaway! I was happy to review the 4 Cd's created by Lanny Sherwin! Lanny is a singer-songwriter and is President of the children's record label, Sandman Records. 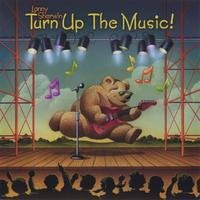 He has released 4 award-winning kids' Cd's, each of which follow his label's motto: "DON'T DRIVE PARENTS CRAZY!" I really enjoy his lullaby Cd's the best. They are so soothing, and relaxing! I could easily relax to his Lullaby collection. On his other two Cd's, he makes his music fun for kids to listen to. My kids like to listen to the songs because they aren't like any other songs out there. The songs are inventive and creative. I have noticed that the songs help encourage the child's mind to create the scenes of the songs. Having spent 10 years as a songwriter in Nashville, Lanny's son, Alec, was born in 1997. 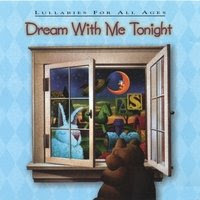 After about 2 months of listening to Barney, Elmo, and other equally brain-frying lullaby Cd's on the market, he decided to write his own, "Dream With Me Tonight - Lullabies For All Ages". Former Asylum recording artist, Melodie Crittenden, sang the vocals. The next year he wrote "Dream With Me Tonight, Vol. 2 - A Father's Lullabies". Gene Miller, a former Mercury Records artist, handled vocals on that CD. Gene Miller is also heard on 'The Lion King II.' As Alec grew up, so did the themes of Lanny's songs. Released in 2006, "Turn Up the Music!" is geared toward 4 - 9 year olds. Lanny himself sang the vocals. That CD has won 8 children music awards.In 2007, he wrote & sang on "I Like Being Me!" - also for 4 - 9 year olds. Lanny started out writing lullabies out of love for his newborn child and out of desperation at having to listen to what was available in the market. Now he just writes because - deep down - he loves being immature. I think that is funny, and that is what makes his music great for kids. You must be a resident of the United States, you can be a blogger or non-blogger to participate. Just go to his site: Sandman Records, and pick out which CD you like best. He offers music samples for you to listen to here. Come back and comment which CD is your favorite, or the one you would like to win. I will pick 4 separate winners for each of the Cd's. This contest will end on July 4Th, at 7:00 PM CST. If you want the extra credits (as with all my contests) you can: blog this contest, subscribe to my feed, or add my button to your side bar. Please make separate comments for each extra credit. Thanks and good luck! Thank you Lanny! Also, for your information: if you sign up for his newsletter on his website, you will be entered in a drawing for a $10 Gift Certificate to Borders Books! How cool is that? 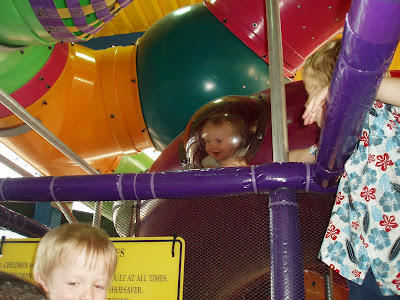 Mary, from Adventures in Mommyland, nominated me for the Arte Y Pico Blog Award. Thank you Mary...you are so sweet to think of me for this! 1. Pick five (5) blogs that you consider deserve this award for their creativity, design, interesting material, and also for contributing to the blogging community, no matter what language. WOW~ I thought it was my imagination, but it is SO very much real! 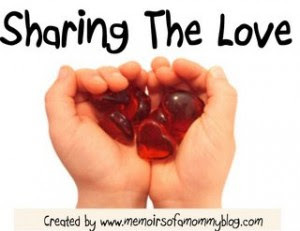 Tonight, as I sit here and blog, I am feeling my little baby making moves in my belly! Oh, what a joyous feeling! So amazing that I feel that little miracle baby move at just 11 weeks! Thank you God for these wonderful, exciting, and miraculous milestones! Thank you for my baby that you have entrusted me with! My friend, Sarah from Milk Mama, gave me this sweet award! Thank you, Sarah! You are too sweet!! Crystal at Memoirs Of A Mommy created this award in honor of the donor that saved Noah's Life. Noah is her son and he had a heart transplant when he was under one month old. He just turned one earlier this month!! Her hopes are that in passing this award around, we are creating more awareness of the importance of organ donation. Alicia, Gretchen, Fratzels, and Tollesons4him! I was so excited when I found out I won the O-Mega Body oil giveaway at Hip Mama's Place! I tried it out this last week, and can I just say that I LOVE it! It is so smooth going on, smells great, and feels wonderful! I love that the Mama-Mio products are safe to use. They are Paraben Free, Petrolatum Free, Sodium Laureth and Sodium Laurel Sulphate Free, Xenoestrogen and Phtalates Free, Colourant and Synthetic Fragrance Free! Thanks Hip Mama'a Place, and thanks Mama Mio! We left on Friday night for Terry's Mom's and Grandma's. We had the truck bed full of things, and Terry had his snowmobile trailer full. We were hauling many things up to Terry's brother's house to store. We had a snowmobile, a lawn tractor, snow blower, table and chairs, tiller, three wheeler, and other miscellaneous things. So, we had a big load. We met up with my parents half way to have supper. It was a very tasty supper...fish, and shrimp (all you can eat) with a salad and ice cream bar. It was very good, and really fun to see my parents, too. So, we headed out. We were within about 45 minutes of our destination when we heard a "POP!" Oh no...the tire blew on the trailer. Terry pulled over, and took a look. OK, the trailer was not going anywhere real soon. After finding out what size the tire was, we drove to the gas station that was about a mile back (fortunately there was one close). We called Terry's mom, and tried to find a place that sold trailer tires. Well, good luck at 10:00 at night, huh? Terry came back to the truck to tell me his mom and uncle were on their way. Then, we thought maybe our roadside service, through our insurance, would work for the trailer. Terry gave the 1-800# a call, and they said they would be about 30-45 minutes. They would tow us to a tire place in town. So, we told his mom not to come. We drove over to the tire place and saw it was just up the highway about 2 blocks, and around a corner about 3 blocks. Terry thought maybe he could just SLOWLY drive the trailer around the corner and bring it to the tire place himself. We were a little worried about wrecking the rim. But, the towing company was on the way, so we went back to the trailer to wait. Soon a car pulled up behind us. It was a worker from the gas station. He told us the towing company would be about 1 1/2-2 hours now because something happened to his truck! Are you kidding? We didn't want to wait that long! So, we drove back to the station to cancel. It was so very kind of the worker to come up to tell us! Talk about outstanding customer service! After Terry made the phone call to cancel, a guy met him just outside the store. It was a customer that was in the store earlier. He overheard Terry talking to the workers and on the phone, and he had run home. He took off his tire from his lawn tractor, and offered it to us to use for the trailer. He said he would like it back, but if he didn't that would be OK, too. WOW~ what a generous guy! I was so impressed that this kind of "help your neighbor" is still around! We did decline the tire, but with much appreciation...it would not have fit. Terry did thank him for his thoughtfulness, though. We did end up driving the trailer to the tire place~ VERY slowly. It sounded like we were in a horse-drawn buggy. Hey, have to keep thinking positive, right? All went fine, we did make it to my MIL's, got a new tire the next morning, and all the equipment is delivered. We were so blessed with such great help and hospitality Friday night! Saturday, the weather was great for the party. It was suppose to be a surprise for Grandma, but she got a B-day card in the mail that week, Saturday someone called and told her they couldn't make it, and someone called just before the party to ask for directions! Can you believe people just don't understand the meaning of SURPRISE?? Oh well, she had fun and was really happy to be with those she loves. Sunday, we visited and had a meal. Terry cut down trees and loaded the truck with wood. Then we headed for home. We were really excited to pick up Nathaniel. It had been 11 days since we saw him. We stopped in to see my parents on the way home, since we were driving right by their place. Caleb helped Grandma fill gallon jugs with water. He loves the hose. Maddie got in on helping, too. We saw Grandma's flowers, too...they smell wonderful! After that, we went home, unloaded our weekend things, and the wood. I changed the kid's diapers, and we were on the road again. We picked up Nathaniel, and he talked non-stop all the way home. He was happy to be back home. We were happy to get him back, too. He does need his time with his dad, but I am sad when he is gone. WonderFall savings at Beaches Resorts! Our family would be so excited to travel to Beaches Resorts ! It looks like the perfect place for a family get-away! With four all-inclusive resorts in the Caribbean, all set upon the most gorgeous white sand beaches in Turks & Caicos and Jamaica, the hardest part is deciding which Beaches to choose! I have never seen any of these places, so I wouldn't be real picky! At Beaches, the best of everything in a family vacation is included. Unlimited dining from a variety of gourmet and specialty cuisine restaurants serving great breakfast, lunch and dinner. Not only are the standard meals included, but kids and parents have access to "anytime snacks" and beverages. I love that all the prices are included in one price. So, you already know what the costs will be. I like that Terry and I can enjoy some time alone together at Beaches Resorts, because they offer a nanny for the kids...we can go to the piano bar, or a stage show. I know that my kids would have a blast at the Pirate's Island Water parks and the wadding pools. They even have a swim-up bar, and Terry and I think that sounds fun, too! I would love to stay in the rooms! They offer ocean view and beachfront rooms that have one and two bedroom suites, some including your very own personalized Butler Service!! Can you just imagine! What a luxury! Even round trip airport transfers, hotel taxes and all gratuities are included in this WonderFall savings from Beaches Resorts! There are some amazing programs at Beaches Resorts I think our kids would really enjoy! Caleb and Maddie would love to see The Beaches Resorts Caribbean Adventure with Sesame Street® and story time with Elmo, baking with Cookie Monster, dancing with Zoe, exploring with Grover, making music with Bert & Ernie to Sesame Street stage shows, character parades and character breakfasts (for a nominal charge). I think Nathaniel would love the kids camps, the Crayola Art Camps and the Xbox 360® Game Garage, featuring the latest video games. I am sure Terry and I would love the gaming, too! There is an unique WonderFALL Celebration at Beaches Resorts, taking place during the off-peak season months of September and October. Not only do you get to enjoy everything Beaches offers year-round but you can SAVE up to 45% off** published rates and get 2 Nights Free** (on stays of 7 nights or more). And as part of this WonderFALL Celebration, Beaches has a great fall line up of special events and activities. From even more Caribbean Adventures with Sesame Street® that includes the premiere of a brand new stage show and a new activity with Abby Cadabby, exclusive Gordon and Elmo live performances and special parenting workshops hosted by Sesame educators, to Dive In Movies, "Baby You're A Star Photo Contest"( where your little one could win the chance to be featured in the next Beaches brochure) and even a celebration for Grandparents, it's all happening ONLY this FALL at Beaches family resorts. 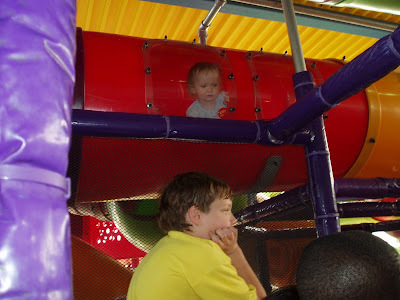 Madelyn, little Miss daring, went for a climb up the Play place. Terry thought she would be OK, so, we let her go up...and she was COMPLETELY delighted! On her way up! Look at that pure joy on her precious little face! 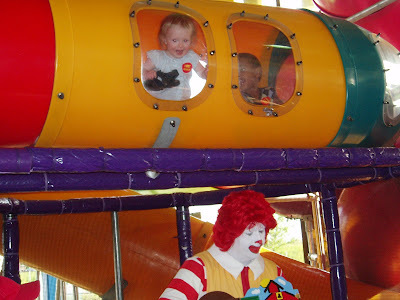 Here she is peeking at big brother, Nathaniel...and taking peeks at Ronald McDonald. Here she is near the top. What a view she got! She just kept giggling, and watching everyone. I think everyone was watching her, too...and wondering why her parents let her go up there! Then, she got a hold of some one's shoe! What a funny little girl. She sure had a great time, though! After the show, we headed up to a parade. The parade was so fun, and the weather was great! I can't believe the parade lasted 2 1/2 hours! I was tickled pink with all the bands that were in it! That is my absolute favorite part of the parades. So many bands/color guards/drum lines have been cut from the parades to save money. I think that is ridiculous! I was so happy to see them that night! I also got to see my home school. It was great to see my old band director still in charge. We had great seats for the parade, too...my friend, Lisa's front yard! Thanks Lisa...even though you weren't home! 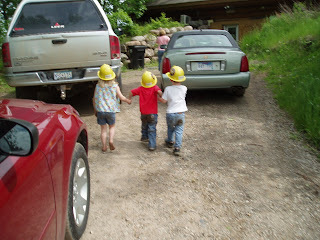 Well, we are heading out for a weekend trip up to see Terry's Mom, Grandma, Brother, Aunts, Uncles, Cousins....etc. Terry's Grandma is having a Surprise 80th birthday party tomorrow. It will be fun to celebrate her and her life. So, I just wanted to let you all know, I won't be blogging this weekend. I will be back on here Sunday night, or Monday. I hope you all have a super weekend!! I love being pregnant! I have never written down what I was thinking, feeling, experiencing with the pregnancy, though! I love this concept! What a great way to journal everything with the pregnancy! I was happy to review The Pregnancy Journal: A Day to Day Guide to a Healthy and Happy Pregnancy, especially since I am in the early stages of pregnancy! I really like knowing exactly what development is happening every day and this book explains it well. There is practical information, medical data, emotional and spiritual fuel, and even "pregnancy trivia." The journal contains about half a page of information for each day from conception through delivery. Nutrition, how to avoid discomforts associated with pregnancy, childbirth customs in other cultures, and practical parenting tips are among the topics touched on. Many days in the journal have a great section called "Did You Know"; for example, from Day 49: "The baby's arms at this point are only as long as this printed 1." At the bottom of each page is a quote from a literary or historical figure; some are sentimental, some pithy, some humorous, all inspiring. Since its publication in 1996, this definitive journal for expectant families has sold over a million copies. Author A. Christine Harris brings a revised and thoroughly updated edition to today s parents-to-be. Still featuring daily entries, a personalized timeline, and pregnancy glossary, the revised edition provides a clearer picture of the baby's in-utero development and the latest advice about giving a growing baby every advantage prior to birth. This review is made possible from MotherTalk! I think this is a great book to have, whether it is your first baby, or your 9th! It makes a great gift to give a new mom, too! 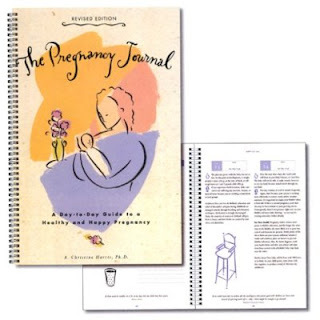 You can get your Pregnancy journal at Amazon...on sale now for $13.57! Last Saturday, we had a family get-together for my Dad's side of the family. We rarely get together with that side of the family anymore, and it was great to connect for a family picnic. 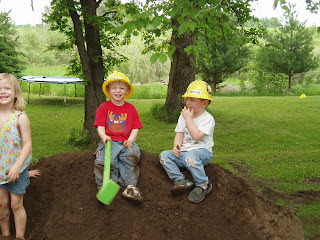 We used to get together every Memorial Weekend when I was younger. I really miss that connection, and that camping weekend to look forward to. One of my Dad's 7 sisters planned this fun picnic day. I had mentioned something to her last year about our family getting together at least once a year. I just don't have the space to host it at my house. Otherwise, I would be all for hosting the event here. Anyway, it was a fun day! My cousin was here from Washington, and she planned fun events for the kids. There was an egg on the spoon race, a find the peanuts in the field hunt, a hoola-hoop contest, a bubble blowing contest...and more. She even had prizes for the kids. When people first arrived we were all given a sheet of paper with scavenger hunt questions on it. Some of the questions were: (1) What is uncle Chester's favorite meal? (2) How many children does Marie have? (3) Who is the youngest person at the party? This question was tricky, because both my sister-in-law and I am pregnant, so we didn't know if that counted or not....it didn't, but Maddie was the youngest one there. It was a fun day, and the weather was great! It got chilly in the evening, and the mosquitoes came out. Wouldn't you know it, I was totally unprepared. I didn't bring extra clothes, a blanket, jammies, or nothing. WE ARE IN MN!! Hello?? You would think I would be more prepared. Usually I am over-prepared, but this time, I just didn't plan. A storm rolled in that evening, too, so we were stranded there for a bit due to the strong winds. I was so happy! That morning, my Mom and I were talking on the phone, and she told me that my brother and his wife are expecting their number 2 child. She is due only about 2 weeks after me! How fun is that? Their daughter is a little over a year younger than Caleb. They told people that they may only have one child. Personally, I think every child needs a sibling, but it is their choice~ no, really it is God's choice. BUT~I am happy to hear that they want to add to their family! Name that Tune~ And a GIVEAWAY! Contest is now closed! Thanks to all who participated! Here are the four winners: dolls123, jpandthe boys, tonya, and carissaad! Congratulations! Please e-mail me your snail mail address, thank you! I am just tickled pink over this super company called Name Your Tune! Name Your Tune is an exciting new children's music compilation that is made-to-order and personalized for each child. Children will hear their name more than 80 times throughout 14 much-loved songs. A great way to enjoy music, have fun, and learn together! I had a CD made for Madelyn and Caleb. It was great seeing their faces light up when they heard their own name in the songs! Caleb kept saying, "How did they know my name?" Madelyn was just surprised and looked at the CD player when her name was sung. 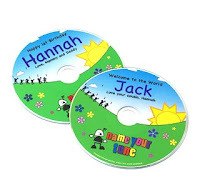 There are 14 songs on the CD and each song is personalized with my children's names! I love that the CD is made extra special with a personal message from me on the CD label. Based in Toronto, Name Your Tune Inc. is founded and managed by Candace Alper. She holds a Bachelor of Arts degree from McMaster University and a Bachelor of Education degree from OISE/University of Toronto. Candace has been active with children and youth in her community through social programs, summer camps and trips abroad. Co-Founder Eric Alper, has been active in the Canadian Music Industry for more than 15 years and a music-lover his whole life. As Director of Media Relations and Label Acquisitions for KOCH Entertainment, Eric brings his unique perspective and experience to Name Your Tune. Candace has graciously offered to sponsor a very generous giveaway for my readers! She is offering 4 Name Your Tune CDs for 4 different winners! You will be so happy to be a lucky winner, and your child will be thrilled! Another great thing is, this contest is open to All Bloggers and non-Bloggers...Everywhere! To enter: Go check out Name Your Tune and check out their site. Then, come back here and comment on what name(s) you would put on your CD if you are a lucky winner. You can do the extra credits by: blogging this contest, adding my button to your sidebar, and/or subscribing to my feed, just leave separate comments. This contest will close June 30th, at 7:00 PM CST. If you want to order additional CD's or can't wait to see if you won, Candace offered a special code for my readers to enjoy a $5.00 discount on your order. Just enter the code: SASSYFRAZZ. Thank you Candace for your generosity! 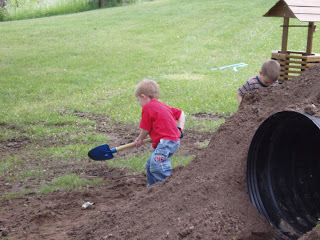 Every little boy's dream...playing in the dirt! They had so much fun! At first the tunnel was scary...but not for long! One little girl, and all those boys! Trinity had just as much fun! 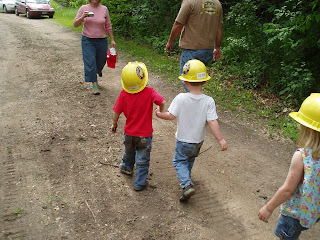 Caleb kept "rescuing" her from the dirt. After awhile, she kept digging her feet into the soil, so he could "save" her! How heroic is that? All smiles after a hard day at work! Caleb and his great friend! Two little buds! Trinity wanted to be in the hand-holding...so she ran up and grabbed on. How sweet! The Momma made a great birthday cake all decked out for the occasion! 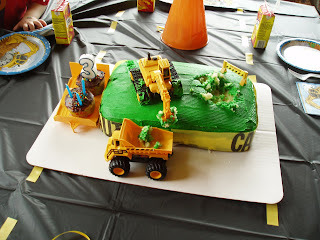 The kids really loved eating the cake out of the trucks. 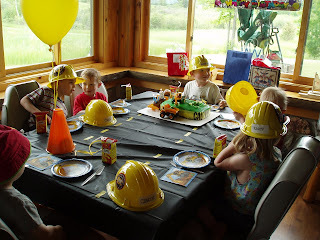 What a fun birthday party! It was done creatively, and the kids had so much fun! The Littlest Pet Shop: AND A GIVEAWAY! Contest is now closed. Thanks for all who signed up for the contest! The lucky winner is tnchick ~ Congratulations! Please e-mail your snail mail address to me ASAP, thanks! Littlest Pet Shop has some really neat products to offer kids for imagination play and virtual play! 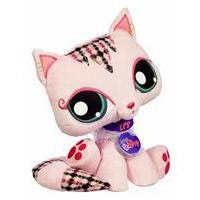 Littlest Pet shop is one of the great product lines from Hasbro. I really like how these products spike imagination play in children. 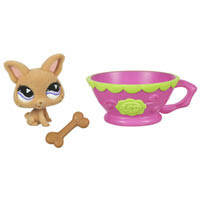 The Portable Pets Chihuahua with Teacup is a cute little puppy to care for. He has a cute little teacup for the puppy to sit in, and a little bone to chew on. This toy is recommended for ages 4 and up, and not for children under 3 years, because of small parts. Product contains magnets. There are more portable pets on the L.P.S. site, too. I really like the Virtual Interactive Pets (V.I.P) they have!. We got the adorable V.I.P cat, and she is so soft and cuddly. There is a secret code hidden in its collar – which is used to unlock exclusive games, activities and lots of other cool surprises! You can Play with your virtual pet pal online while you snuggle your plush pet at home. The more pets you have, the more ways you can play with other virtual pets. Click here to see more of this fun activity! There are many V.I.P pets to chose from. Currently, there are 17 pets - including the Cat, Dog, Turtle, Pig, Monkey, Butterfly, and more. The Littlest Pet shop has a digital pen that features a digital on-screen pet that you can “feed,” brush” and play on-screen games with! You just set the pen’s digital clock and your pet is ready to play! Take care of your pet and it will love to play games with you! Beat the high scores and unlock hidden games and surprises. 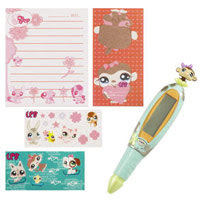 Use the pen to write notes and secret messages to friends with the included paper and sticker sheets! There’s even a TEENIEST TINIEST PET figure that sits on top of the pen, and you can remove this pet to play with! Pen comes with pad of paper, note pad and 2 sticker sheets. Would you like to win your own Littlest Pet shop V.I.P pet? Hasbro has generously offered to sponsor a giveaway for one of my readers to win a Cat, Dog, Turtle, Pig, Monkey, or Butterfly. This contest is open to bloggers and non-bloggers of the United States. Here are the rules: Go to the Littlest Pet Shop site, take a look around, then come tell me which pet you would like to win. I will close the contest on June 28th, at 7:00 PM CST. You can get extra entries by blogging the contest, subscribing to my feed, or by adding my button to your side bar...just leave extra comments for each extra credit. GOOD LUCK! What an educational video TripFlix is! 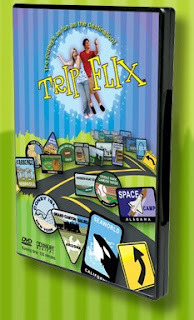 TripFlix is a fun-filled interactive DVD that features some of the coolest kid-friendly destinations to travel across the United States! This DVD introduces 25 featured locations to check out. I love that this DVD shows what different states have to offer, and also gives some history facts about locations and destinations. Before going to a new location, the video asks a trivia question, where you need to chose the correct answer. We really enjoyed seeing (with a virtual tour) new locations we have never seen or heard of before. I love the idea of this video to introduce parents and children to new places. It makes me what to start planning a future trip to one of the locations. Caleb, who is 3 years old, thinks this DVD is great! He loved learning how to make boats, and teddy bears...the pictures and views of the different locations where great! The host and hostess of the DVD are two teens. I think some of their communications with one another is a little on the picking side, but some of their comments are funny. They help kids stay entertained. TripFLIX was inspired by a long car ride to the beach. Who Started TripFLIX? Parents Dave and Ilana Bittner and their toddler, Scotty, packed up the car for a trip from their suburban Maryland home to Ocean City, MD for a weekend getaway. Crossing the Chesapeake Bay Bridge, the toll booth operator handed them a printed pamphlet called The Bay Game, which featured trivia and games for kids to help make the drive more interesting. It was nicely done, but Dave and Ilana couldn't help wondering if there was a way to make an engaging, interactive educational media piece for kids that let them choose their own adventure, from coast to coast. You can get your TripFlix at Amazon for $19.99. Thanks Team Mom for this review opportunity! 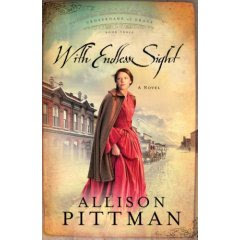 Belleville, Illinois and Wyoming Territories, 1861Born into a life of privilege, fourteen-year-old Belinda never questions her security, even as she leaves Illinois with her family to discover new adventures in the Oregon Territory. But when disaster falls, Belinda is left wounded, weak, and alone. Her faith in God gives her the only strength she knows in a harsh new world.Belinda’s journey takes her to a snow-covered mining camp and a red-roofed brothel in the Wyoming mountains, but not before she must spend a lonely winter with the man who took away the life she knew. Throughout the grief and hope of a strange land, Belinda must decide if her faith is big enough to allow her to forgive.The satisfying conclusion to the Crossroads of Grace series, With Endless Sight offers a rich story of family, new beginnings, and the freedom that grace can bring. Allison Pittman is the award-winning author of Ten Thousand Charms and Speak Through the Wind. Before her recent success in fiction writing, Allison spent seventeen years teaching high school English. Now a full-time writer, Allison serves as the director of her church’s Theater Arts Group ministry. She lives in Texas with her husband, Mike, and their sons. Thank you Multnomah Books for this book review opportunity! I think the baby must be growing a lot these days. I have been so very tired this week. I have been more nauseated with this baby, too. All the signs, I am thankful for. I know that things are progressing normally with the tiredness and feeling a bit sick. Last night, I really didn't feel well, but I am thankful that I got to bed a little earlier. Yesterday, it worked out that Caleb and Claudia took a nap at the same time. Then, Nathaniel was reading on the couch, and I sat there with Madelyn. Lo and behold, Maddie fell asleep, and I got to take about a 20-30 minute snooze. It was great! I hope to have a few more of those kind of days this week! I am so thankful that I am back to babysitting. It is great to see Claudia and Candace again. The kids are so happy to be together, too. Today, Nathaniel got to spend the day with his friend while I babysat. He was so excited to go over there. I want him to enjoy his summer, too, and I know if he went with me babysitting everyday, that wouldn't be so fun for him. I think I am going to try my best to book a "play date" for him once a week. 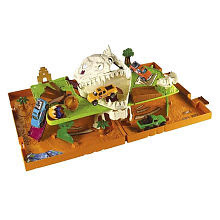 The Dino Mountain Pop-Up playset opens up from a crate-like carrying case to reveal a thrilling treasure hunt in the world of Dino Mountain. Caleb loves playing with the truck that comes in the set, and he likes that he can bring this playing set wherever he goes. He loves driving the vehicle threw the jaws of the Dinosaur. When the vehicle goes threw the jaws, his eyes glow and his voice rumbles in a growl! Along with a Matchbox vehicle, there are accessory pieces included in this set. The set comes in a cool crate-like case that features a try-me feature for the lights & sounds of the menacing Dino Eye on the outside of the case. One vehicle included. Additional vehicles sold separately. This toy is made for ages 3 years and up, and Caleb loves it! You can get a Dino Mountain from Matchbox at Amazon, Wal-Mart, and Toys'R'Us. I am so thankful for spring and the chance to be outdoors more. I hope that with this pregnancy I can keep off the weight I have lost. I just need to be careful that I watch what I eat, and to get the exercise I need to stay fit. I am so thankful that the baby is doing well, and that I have the signs to show that everything is ok. I am thankful for tiredness, and I am thankful for the nausiation! I know that is crazy, but it does reveal that everything is ok.
Maddie is such a little girly girl, and she was so excited when we got Ba Ba Baby Elmo! She loves to hold her little Elmo and give him his bottle. Elmo says, " Ba Ba, Ba Ba please!" 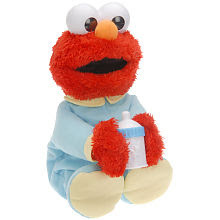 I would prefer if Elmo pronounced Ba Ba as bottle, but it is a minor thing to overlook, since he is a baby. I just like toys to pronounce words correctly. Maddie loves to give Elmo his bottle. When she puts the bottle in his mouth, he makes slurping sounds, shuts his eyes, and sometimes hums a lullaby. We love how Elmo shuts his eyes when he is drinking, or sleeping. Maddie thinks Elmo is so funny. She really giggles when he kicks his feet around as he drinks. Occasionally, Elmo will say, "Burp please." Then, you just give Elmo's back a few pats, and he says, "Excuse Elmo," or Thank You." Then, he will say, "More, please." I really like that Elmo is so polite! This '12 inch adorable Elmo doll is recommended for 18 months and up. Requires 3 AA batteries. I think this Ba Ba baby Elmo doll is super cute, cuddly, and fun for little kiddos! You can find this Elmo doll at Target, Toys R Us and Amazon online. Contest is now closed! I picked a new lucky winner~Barbarabaker! Congratulations to you! I have e-mailed her and if I don't hear from her, I will pick a new winner. Thank you to all who entered! I did a review on a super Lug travel bag called the Puddle Jumper. You can read my review: HERE. I think they make excellent products! Lug is generously offering to sponsor a giveaway to a Sassyfrazz reader! Go check out there site: Lug Travel, and pick out you favorite item they have to offer! You will have a hard time choosing one! I will say, I love my Puddle Jumper! Then, come back here and comment about what you like. Be sure to notice they offer different colors of products! This contest is open to bloggers and non-bloggers of the United States. You can earn extra entries by: blogging this contest, subscribing to my feed, or putting my button on your blog. Please put separate comments for each entry. Contest is open until June 23rd at 7:00 PM CST. Thanks, Lug Travel for sponsoring this giveaway! Sorry I have been "away from" the computer for a few days. We have been busy in our household!! Wednesday night, my Mother-in-Law came down for an extended weekend visit. It was great to see her, spend time with her, and watch her enjoying her grand kids. The kids just love their Grandma! On Thursday, she went with Nathaniel to his "Picnic Day" at school. 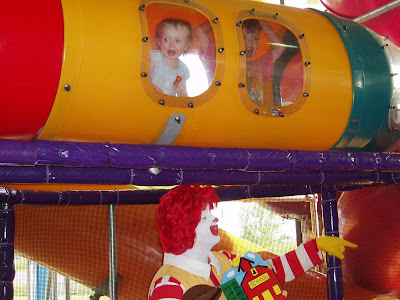 They had outside games, and a big inflatable toy to play in. She surprised Nathaniel with Dairy Queen for lunch. He had forgotten his lunch at home, so she said she wanted to pick up D.Q. for him and Caleb. I had to bring Maddie to the Dr. appointment, so it worked out great! Caleb had fun being at the school too, until I came to pick him up. He wanted to stay there all day. Friday, I got to have a day with Nathaniel. It was his last day of school, and we went to a big Community Center. We got to go swimming and there was a big slide there. Nathaniel and I had a great time. 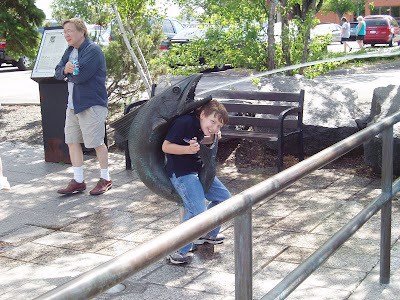 There was another boy with us that I was chaperone of. He was very quiet, and looked at me funny when I tried to spark up a conversation with him. 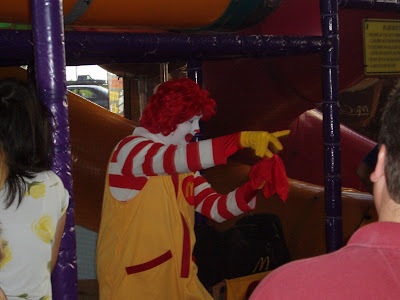 Kids like that kind of intimidate me. I really tried to get him to converse with me, and maybe squeeze a smile out of him. But to no avail, he with held. Oh well. At least Nathaniel and I had a really fun time. I didn't go down the slide, just because I am prego and I really don't want to do anything that may hurt the baby. I am not sure if it really would have done anything, but I would rather be safe than sorry. I did get into a game of tossing the ball with some boys. It started out with just Nathaniel and 2 of his friends. I threw it to one of them, and they threw it back to me. It was fun to watch them try to be the one to catch it. Pretty soon more boys came. I think there was about 10 boys playing after awhile. What was really funny was a couple of girls tried to get in the game, and if they got the ball...they started swimming away. All the boys went after her to get the ball back. It was quite comical. It was great to have one on one time with Nathaniel. We don't get that time enough, so I really appreciated my day out with him. Thanks Cheryl! You rock!! Friday night, Terry and I brought Nathaniel to meet his Dad. Afterward, we went to watch trains. This is a highlight most times with our traveling to bring Nathaniel to meet his Dad. This time we went, we went up on a bridge and looked down on the trains and train yard. It was really neat to see the new views. Those cars are huge and really look so different from the top angle. While we were gone, Cheryl and Caleb took out all our tiles in our kitchen and dining room. Caleb had a great time taking out the tiles. He told Grandma that Dad will be really happy when he gets home. He wanted to start in on putting down the new flooring. I will see if I can get the pictures Grandma took of him uploaded on here. When we got home, we tried out our new Mario Kart game for the Wii. It was super fun! I really love this new game! There are so many games and things to learn on it! It will really be a big hit this fall/winter when we are indoors more. Saturday morning, we started our floors in our kitchen/dining room. We worked on them Sunday, too! We decided to get new flooring because our tiles were really bad. So, we put in real hardwood flooring. It isn't done quite yet, but it is so beautiful! I really love the new look! We really want to start painting, too, so we did buy one gallon of paint to start with behind the refrigerator, since it is pulled out. I hope we have enough paint to get the parts painted that we want that color. I was talking to my sister on the phone Sunday night, and she told me they are doing the same colors we are for their kitchen/dining rooms. I guess great minds think alike!! Sunday afternoon, Caleb went to his friend's birthday party. It was a great party. 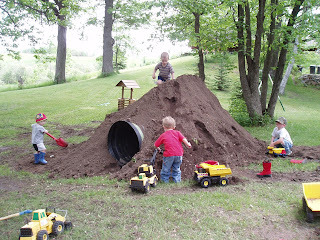 The invitation said to come and dig in dirt! Be prepared to get dirty, and if you must, throw your clothes away. It was super! Caleb got really dirty. I will post pictures on here soon for that, too. 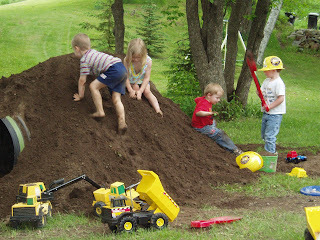 There were 6 little kids there to dig in the big pile of dirt, and they really had a blast! So, there is my long weekend. Sorry my blog has been mute for a bit. I will try to be good about posting a lot this week. This pregnancy is making me so tired. I am happy to say Maddie and Caleb are healthy. I am glad we are on vitamins, too. I brought Maddie to the Dr. He said that the rash was probably caused from fevers all week. When he pushed on the spots, they went away, then when he lifted his fingers they reddened again. He said that is similar to a heat rash, or a rash from fevers. If the redness didn't go away, that would imply that maybe it was a viral rash of some sort. She does have a double ear infection. I am thinking this may be her first ear infection. He said there was quite a bit of fluid in there. I feel so terrible for not bringing her in on Monday or Tuesday, but it is hard to know if it is "just a virus that has to run it's coarse," or it is something more serious. Well, I am glad to know that she will be treated with Amoxicillin now, and she should start perking up tomorrow night or Saturday! YEAH!! I also picked up Poly-Vi-Sol vitamin drops for her, toddler vitamins for Caleb, and the infant Tylenol and Motrin drops. So, I am going to make sure that Caleb and Maddie get vitamins everyday now. That won't hurt them, and maybe it will help protect their immune systems better. I love Uncommonly cute's newest shirt for tots~ "Talk to the hand!" Coming from one Sassy momma...my little miss sassy-pants, Madelyn, is now going to be strutting her stuff in this shirt! I love Uncommonly Cute's cute baby clothes! I was very lucky to review their cute baby clothes in April, when Maddie got a Drama Queen T-shirt. That shirt really states her personality, too! Uncommonly Cute has some really great new arrivals! I really like the I scream shirt, too! The cute baby clothes offered from Uncommonly cute are onesies, short sleeves and long sleeve shirts, and they even offer shirts for twins. The sizes range from Preemie (up to 7 pounds)- Size 6 (up to 45 pounds). Uncommonly Cute's t-shirts and onesies not only afford babies a sense of individual style-be they a Diva, a Rock Star or a Fashionista-but comfort as well. Each garment is made of 100% combed cotton and is super, super soft. Sure to delight the babies' no-fuss, socially conscious moms, the clothes are all machine washable, safe, durable and made in sweatshop-free American studios. Uncommonly Cute supports Room to Grow and R Baby Foundation by donating a portion of their profits as well as merchandise to those cuties in need. With Sammy and Jacob as her inspiration and her husband (and not-so-silent partner) Ben's incredible support, Allison is quite happy to be shaking things up in baby apparel, replacing conformity with individuality; cute with uncommonly cute. I have not been blogging as much this week, because my baby has been pretty sick. That, and with being pregnant, I have been tuckered out. It has been a long week, so far, with Madelyn and her sickness. I am pretty sure it was/is a virus, but I think we are FINALLY on the tail end of it. She was pretty miserable most of the last 4 days. On Monday, her temperature actually got as high as 104.2 under the arm!! I have never seen the thermometer go that high on one of my kids! It was pretty scary. She has had so much Motrin and Tylenol the last 4 days. I am actually surprised how long the fevers lasted. Last night, her fever was 102.5 under the arm, and sometime during the night we think her fever broke. Yesterday she had about 4-5 diarrhea diapers, and today she had two. She woke up with a slightly elevated fever, and with a diarrhea diaper, we did stay home from babysitting today, too! We have missed so much babysitting with my kids being sick so much this year. It is not good for our pocketbooks, and it definitely doesn't help out Candace with us missing, either. I know she is understanding, and for that I am so grateful. 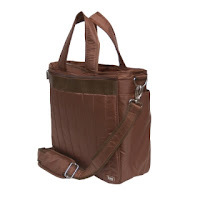 I have found a great new bag offered by Lug! It is called a Puddle Jumper. It is an Overnight/Gym Bag. I personally use mine for a diaper bag. I love the material this bag is made out of! There are many pockets to hold all my things and keep me organized. I really like that it is so stylish looking, too! I really love the ventilated pocket on the bottom...for keeping out smells. 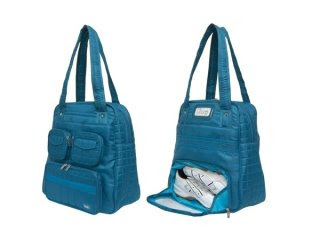 If you use it for a gym bag, you can easily fit your shoes in there, and they won't smell up your whole bag. I figured I could put soiled clothes in there. 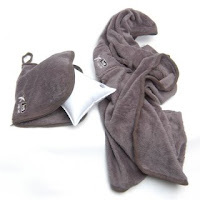 The bag also has a piece of plastic covering the bottom of the bag, so if you set the bag down on a locker room floor (which is sometimes wet) your bag and belongings won't get soaked. The overnight/gym bag comes in 7 colors: crimson red, fog gray, chocolate brown,grass green, ocean teal, rose pink, and sunset orange. The bag is sold for $75.00, and can be purchased here. Lug is a manufacturer that supplies retailers nationwide with quality and innovative travel accessories. Lifestyles are changing the way we live and Lug's goal is to design wonderful products that reflect these times. We offer travel related products with a commitment to create excitement and function in the products we design. Not only do we care about how you travel, we care about how you feel when you travel. Our products are specifically designed to keep you organized, in control, and looking good. We understand that travel disrupts a daily routine so our products are made to ease the transition by providing organization and innovation while you navigate through your day. Sorry, I have taken a mini vacation from the Bloggin' world over the weekend. I was home, just busy an not online. I hope you all had a super weekend! Friday afternoon, I had my ultrasound. I went to a different location this time, and I am regretting that decision. The tech lady I had was horrible! I was so disappointed with the service, and I am definitely complaining! I have had internal ultrasounds with every baby, and also when they have had to look for cysts, so I know the drill. They always give you a thicker (like a table cloth) sheet to cover your body from waist down, and you put your feet up on the table~ while totally covered. The techs I have had always had me insert the probe, too. Well, this tech did everything wrong, I believe. She handed me the paper thin cover (like a paper towel)...which this is used for the other yearly visit. Then, after she came back in, she had me put my feet in the stirrups! If that wasn't bad enough, then she did the insert by herself, and just left me out there. NO covering me back up for privacy. It was totally uncomfortable. I asked her a few questions, and she was completely against giving me information! I was so unhappy with her. She didn't have any bedside manners, and really didn't put effort into small talk. Then, to really add icing to the visit, she started moving the probe around like she was digging. It was totally uncomfortable, and it actually hurt! I told her it didn't feel very good, and she just said, "Well, I am trying to get a good picture of your ovary, and yours is tilted back." OK, SO WHAT!! I am pregnant, and you have no business digging around in there and causing pain! I have never been in pain for a visit like that. Even when I have been in for cysts on my ovaries, when they needed the pictures to be super clear. You know something isn't right when you are actually sore after a visit like that. ON THE GOOD SIDE~~ I did get to see my little baby and that little heart just beating away! AMEN, and Praise the Lord! I was so happy! According to the ultrasound, I will be 8 weeks along on Tuesday. Yeah! So, my due date should be January 13 or so. Toward the end of the pregnancy, they will watch everything closely. With Caleb my amniotic fluid was low, and with Madelyn, it was almost gone on her due date. So, as my Dr. has mentioned, it won't get better with anymore, but it will be something we will have to be careful to watch. I am at a whole new clinic and new Dr.'s now, so I hope and pray all goes well. Saturday, we got a lot done around the house, and Terry started working in the Hobby store. Then, Saturday night, our friends came over to have a grill out, and hang out. It was a fun night. We got a good storm through here, but the really bad stuff missed us. (Thankfully). Today, we went to church. My aunt and uncle treated us to Subway. It was yummy! Maddie started not feeling very good, and she was actually kind of warm. So, when we got home, I gave her Tylenol. She is cutting 4 teeth, her first teeth, so I am not sure if that is why she had a fever or not. My aunt and uncle came over after Subway, and we went for a pontoon ride. It was a gorgeous day! Maddie got in a great nap on the boat. In the evening, Maddie was feeling a bit better, so we went to a MOPS family picnic. 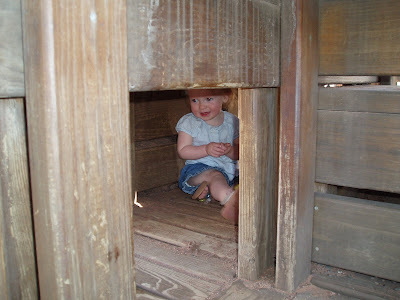 Unfortunately, when we were there for just a bit, her fever spiked. So, we didn't stay too long. I feel so bad for her! I hope this (what ever it is) goes quick. I am suppose to work tomorrow, after being off for a week and a half. Not only does Candace need my help, but we need the money, too. I really am tired of my kids being sick so much! Tonight, Caleb's legs are so swollen from bug bites! He has bumps behind his ears, and a few on his head. Poor little guy. So, he had an Aveeno bath, and Benedryl before bed.